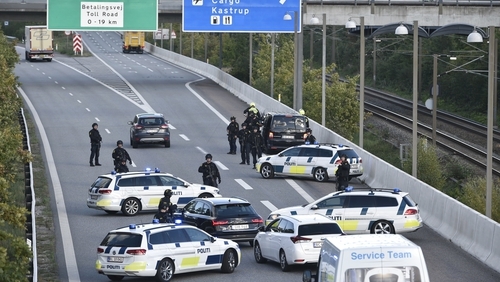 Danish police said they briefly shut bridges and ferry links to Sweden and Germany as they hunted for a black Volvo and three people linked to a serious crime, that one newspaper reported was a kidnapping. Denmark's armed forces said they also took part in the operation, without going into further detail. Police have said they are still looking for the Swedish-registered rental car. "The vehicle probably contains three persons linked to serious crime," the police said in a statement. Swedish newspaper Aftonbladet, quoting unnamed sources, said the operation was linked to a kidnapping in Denmark. Police did not confirm the report. Earlier, police briefly shut the Oresund bridge and tunnel - a near 16km road and rail link with Sweden that featured in the TV crime drama 'The Bridge'. Other bridges, ferry services and Copenhagen's main railway station were also temporarily shut. "In connection with the current investigation, the Copenhagen Police is searching for a black Swedish-registered Volvo V90 with registration number ZBP 546," the police said in a statement. The Volvo was operated by First Rent A Car in Stockholm, the Swedish car registry showed. The firm did not respond to calls for comment.